The Moon, of course, has been known since prehistoric times. It is the second brightest object in the sky after the Sun. As the Moon orbits around the Earth once per month, the angle between the Earth, the Moon and the Sun changes; we see this as the cycle of the Moon's phases. The time between successive new moons is 29.5 days (709 hours), slightly different from the Moon's orbital period (measured against the stars) since the Earth moves a significant distance in its orbit around the Sun in that time. Due to its size and composition, the Moon is sometimes classified as a terrestrial "planet" along with Mercury, Venus, Earth and Mars. The Moon was first visited by the Soviet spacecraft Luna 2 in 1959. It is the only extraterrestrial body to have been visited by humans. The first landing was on July 20, 1969 (do you remember where you were? ); the last was in December 1972. The Moon is also the only body from which samples have been returned to Earth. In the summer of 1994, the Moon was very extensively mapped by the little spacecraft Clementine and again in 1999 by Lunar Prospector. But the Earth is not completely fluid, either. The Earth's rotation carries the Earth's bulges slightly ahead of the point directly beneath the Moon. This means that the force between the Earth and the Moon is not exactly along the line between their centers producing a torque on the Earth and an accelerating force on the Moon. This causes a net transfer of rotational energy from the Earth to the Moon, slowing down the Earth's rotation by about 1.5 milliseconds/century and raising the Moon into a higher orbit by about 3.8 centimeters per year. (The opposite effect happens to satellites with unusual orbits such as Phobos and Triton). The asymmetric nature of this gravitational interaction is also responsible for the fact that the Moon rotates synchronously, i.e. it is locked in phase with its orbit so that the same side is always facing toward the Earth. Just as the Earth's rotation is now being slowed by the Moon's influence so in the distant past the Moon's rotation was slowed by the action of the Earth, but in that case the effect was much stronger. When the Moon's rotation rate was slowed to match its orbital period (such that the bulge always faced toward the Earth) there was no longer an off-center torque on the Moon and a stable situation was achieved. The same thing has happened to most of the other satellites in the solar system. Eventually, the Earth's rotation will be slowed to match the Moon's period, too, as is the case with Pluto and Charon. The Moon has no atmosphere. But evidence from Clementine suggested that there may be water ice in some deep craters near the Moon's south pole which are permanently shaded. This has now been reinforced by data from Lunar Prospector. There is apparently ice at the north pole as well. The Moon's crust averages 68 km thick and varies from essentially 0 under Mare Crisium to 107 km north of the crater Korolev on the lunar far side. Below the crust is a mantle and probably a small core (roughly 340 km radius and 2% of the Moon's mass). Unlike the Earth, however, the Moon's interior is no longer active. Curiously, the Moon's center of mass is offset from its geometric center by about 2 km in the direction toward the Earth. Also, the crust is thinner on the near side. There are two primary types of terrain on the Moon: the heavily cratered and very old highlands and the relatively smooth and younger maria. The maria (which comprise about 16% of the Moon's surface) are huge impact craters that were later flooded by molten lava. Most of the surface is covered with regolith, a mixture of fine dust and rocky debris produced by meteor impacts. For some unknown reason, the maria are concentrated on the near side. Most of the craters on the near side are named for famous figures in the history of science such as Tycho, Copernicus, and Ptolemaeus. Features on the far side have more modern references such as Apollo, Gagarin and Korolev (with a distinctly Russian bias since the first images were obtained by Luna 3). In addition to the familiar features on the near side, the Moon also has the huge craters South Pole-Aitken on the far side which is 2250 km in diameter and 12 km deep making it the the largest impact basin in the solar system and Orientale on the western limb (as seen from Earth; in the center of the image at left) which is a splendid example of a multi-ring crater. A total of 382 kg of rock samples were returned to the Earth by the Apollo and Luna programs. These provide most of our detailed knowledge of the Moon. They are particularly valuable in that they can be dated. Even today, more than 30 years after the last Moon landing, scientists still study these precious samples. Most rocks on the surface of the Moon seem to be between 4.6 and 3 billion years old. This is a fortuitous match with the oldest terrestrial rocks which are rarely more than 3 billion years old. Thus the Moon provides evidence about the early history of the Solar System not available on the Earth. 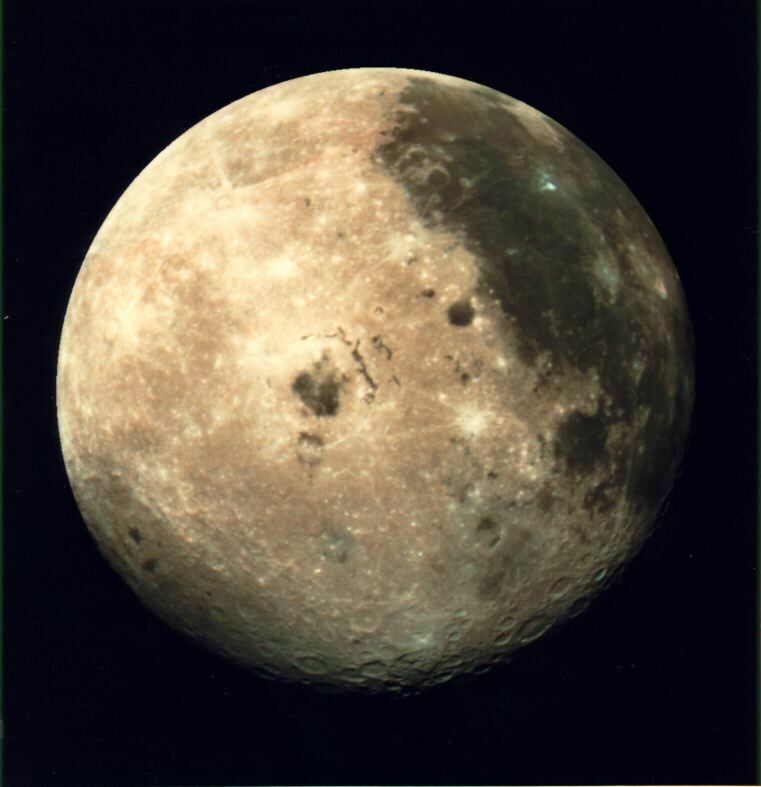 Prior to the study of the Apollo samples, there was no consensus about the origin of the Moon. There were three principal theories: co-accretion which asserted that the Moon and the Earth formed at the same time from the Solar Nebula; fission which asserted that the Moon split off of the Earth; and capture which held that the Moon formed elsewhere and was subsequently captured by the Earth. None of these work very well. But the new and detailed information from the Moon rocks led to the impact theory: that the Earth collided with a very large object (as big as Mars or more) and that the Moon formed from the ejected material. There are still details to be worked out, but the impact theory is now widely accepted. The Moon has no global magnetic field. But some of its surface rocks exhibit remanent magnetism indicating that there may have been a global magnetic field early in the Moon's history. With no atmosphere and no magnetic field, the Moon's surface is exposed directly to the solar wind. Over its 4 billion year lifetime many ions from the solar wind have become embedded in the Moon's regolith. Thus samples of regolith returned by the Apollo missions proved valuable in studies of the solar wind.